This Diamond ring is one of my all-time favorite pieces I have designed. When it made it to the Etsy Finds email on August 14th my shop visits increased substantially. I got many views and inquiries about this ring as well as others designs. This lucky ring is made from 18k White Gold and it has a total of 0,84ct of F-Vs Diamonds surrounding the ring. Special details such as the engraving and the square azures add a little more beauty and elegance to my creation. 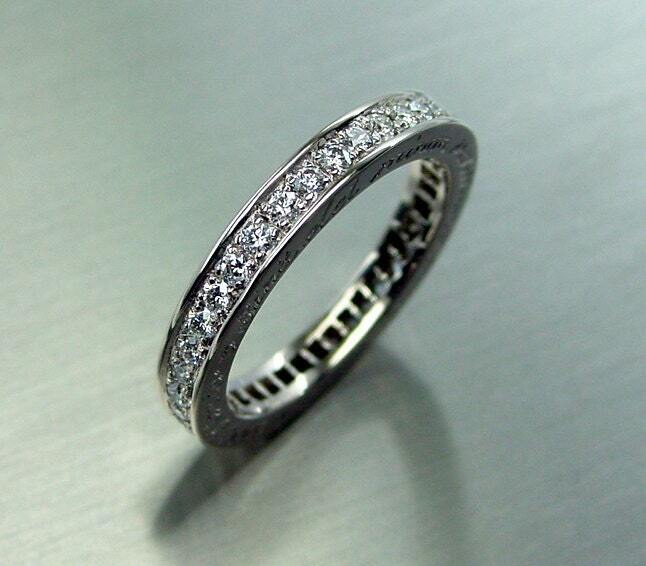 This ring is a classic eternity ring, which means that the diamonds go around it. Eternity rings are considered a symbol of eternal Love, and they are really popular for weddings and as elegant and great anniversary gifts. I wanted to add to this classic ring something unique and delicate, and that is why I started doing the engravings on to the side of the ring. I have originally designed this ring many years ago, but it is a timeless piece, that many brides-to-be have chosen as their engagement ring or their wedding ring. I think that one of the main reasons of this piece success is the engraving on the side of the ring, because it gives a unique signature that makes it very personal and different. I can promise that this eternity ring is even more gorgeous when you see it in person. For my rings. I always choose exceptional quality diamonds that match each other perfectly. I honestly think that you can see the quality of this ring with your own eyes, and the fact that this ring is completely handmade, really gives it a great, flawless and unique appearance that you can’t find anywhere else. Pasi Torkkeli is a fine jeweler from Finland with more than 10 years of experience. He loves doing engagement rings, wedding bands and other design jewelries. From his shop you can find a quality selection of diamond jewelries, like earrings, brooches and rings. He also like to use different gemstones and materials, such as titanium, palladium, white gold, yellow gold, rose gold, platinum and sterling silver. Wow, that gives me a whole new creative idea for my diamond eternity rings, thank you! 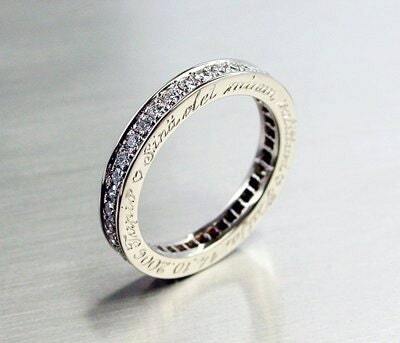 The engraving will surely add some drama to the ring. Wonderful idea. Thanks! we are happy you found inspiration in Passis Ring, indeed the engraving adds personality and a personal touch to this ting. Thanks for your comment!